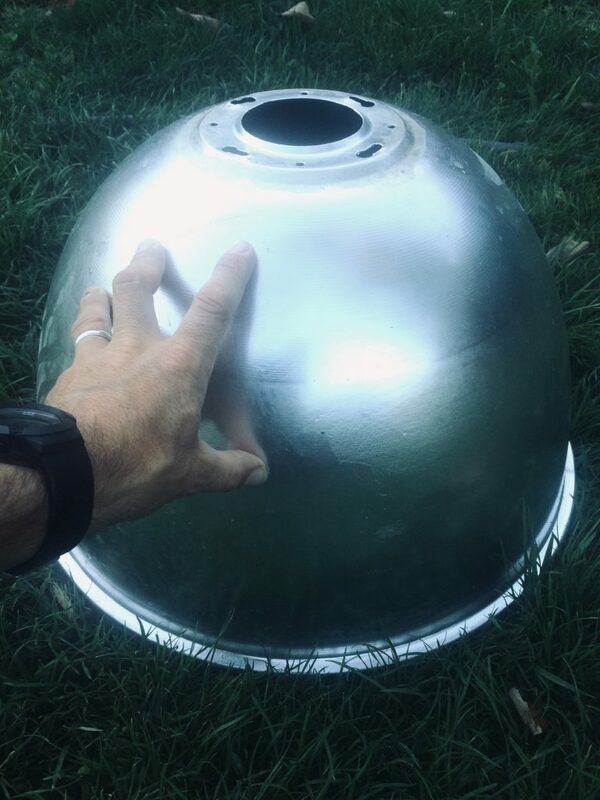 Campo: Upcoming: Aluminium Lapm-shade Solar Oven / Cooker. Found thrown industrial lamp-shade (fthr: Cap). Light weight aluminium, nice and shiny inside. Idea is to make a solar cooker. Inner hole will be closed. Will serve either some aluminium or round mirror, or right size inox plate. The outer Cap walls could be* thermaly insulated. Possibly I will put a cap in to right size of poli-bucket filled with insulator. Possibly Makroflex might serve a purpose. Additionaly will apply black matte paint over it. The lid to close the Cup should be clear, ideally double and preferably light weight. Have to find sort of heat resistant plexiglass. Possibly there are glass pot-lids of size 48 cm. I presume, within oven should fit 1-1.5 l closed glass jar, in which cooking will take a process which is similar to the pressure-cooker. *: Closing and insulating the Cup is necessary only to condense inner heat, keeping inside container (jar) not being cooled, but I will check soon if it is possible to boil-cook in ½ l jar using only focused light-beam.